This rich and creamy dip will add lots of wow to your chips! In medium size bowl with fork mash avocados, salt and lime juice together. Mix in tomatoes, garlic, onions and cilantro. Refrigerate or serve immediately with chips. 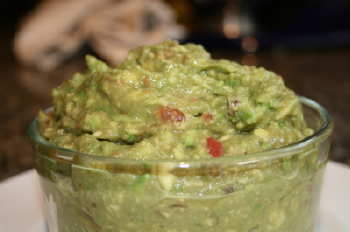 Im medium size bowl mash avocados with a fork then combine all the rest of the ingredients until well blended. Refrigerate or serve immediately with chips.